The Honda CR-V is a compact SUV that provides style, power, and responsive handling. The CR-V is the perfect size for your lifestyle. It’s big enough to hold everything you need while at the same time delivering great fuel economy. From the exterior design to the interior spaciousness, the CR-V is a pleasant surprise. The vehicle is powered by Honda’s reliable engineering for drivability and performance, providing outstanding sedan-like riding comfort. The CR-V continues to lead in innovative performance efficiency and fuel economy. Honda has developed a totally new engine for the CR-V – the 2.0-L i-VTEC engine – which gives optimum power output at urban driving as well as under heavy load. The Honda CR-V boasts a new 2.0 litre i-VTEC engine, superb handling, an improved suspension system, and the return of better mileage over large distances. Driving the CR-V lets you experience a sporty flair. The revvy, free-breathing 2.0 litre i-VTEC engine is rated to 150PS to summon effortless speed from start. There’s little denying the CR-V’s talents – it does all this while simultaneously improving fuel efficiency and producing cleaner emissions, thanks to lightweight construction. All these show what the new 2.0 litre i-VTEC engine is really capable of. It gives excellent torque output over the entire engine speed range for an exciting surge of power, like a giant hand pushing you towards the horizon, delivered with confidence and control. That’s the assured hallmark of Honda. 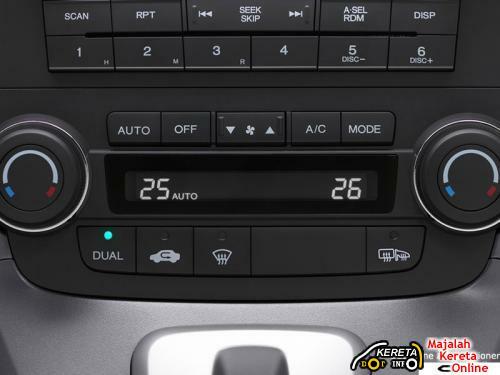 With the new 5 Speed Automatic gearbox, the CR-V has a wider range of gear ratios to provide a more fun to drive feeling and also good fuel economy. The redesigned aesthetics of the Honda CR-V are engineered as much to please the eye as to cut cleanly and efficiently through the air. A sharply-raked windscreen, flat undercarriage and smooth lines give it a slippery profile on the road. The CR-V rides and handles in ways large SUVs shouldn’t: with grace, poise and dynamism. Nothing distracts your attention. This means the CR-V provides the best conditions for driving – rewarding you with enjoyment, relaxation and safety. All this leads to significant improvements in fuel efficiency, returning better mileage over large distances and economical consumption on urban roads. Every component in the Honda CR-V is built with one thing in mind: all-round satisfaction. The multi-way adjustable front seats distinguish the practicality for front passengers. Backseat passengers also benefit from intelligent engineering. The rear seats can slide backwards to add precious inches of legroom or slide forwards, to create more boot space. And if that isn’t enough, they also fold back to double the cargo area to fit almost anything. And when you need to divide certain loads, a useful shelf does the job neatly for you. provides maximum space for cargo. offers relaxation and an enjoyable break from travel. offers enlarged cargo space while seating four adults. allows loading long items while seating four adults. ecourage one to continue your great writing, have a nnice evening!